Whats is PTC? PTC is abbreviation of Paid To Click. Paid To Click sites pay you for viewing sites, they pay you for every click on their ads. The part of the PTC site where you can view ads is called PTC section and is often marked as PTC Ads/View Ads/View Advertisements. You usually find it in menu under Earn Money. PTC systems – How does it work? You choose an ad, click on it, new window/tab opens with the ad. Time is running down. When it’s off images appear. Choose the correct one. Usually it is the upside down one (e.g. LegacyClix). Or the one next to “Click” (e.g. Cashons). Sometimes the reward credits automatically without the need of validating the ad view (e.g. Neobux). Or you choose the correct image before viewing the ad (e.g. Clixsense where you choose cat). Sometimes PTC sites have also a PTR (Paid To Read) section. It is very similar to PTC section, you just have to read short description of the ad before you are taken to the ad itself. PTC sites with PTR section: e.g. CashCamel, CashTravel, MagicalClix. Many PTC sites have also a game called AdGrid. The title of the game varies, usually part of the site’s title is added to the game title (e.g. ClixGrid). AdGrid is an image divided into squares. You click on ads in squares. You get a certain amount of chances you can use every day for free. You click a square and after time runs out you will know if you won or not. You get various prizes – memberships, points or cash up to $50. E.g. 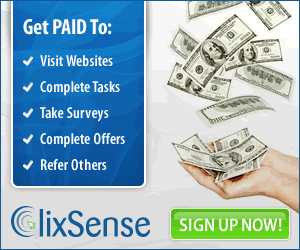 at Clixsense you can win up to $10. Neobux also have a similar game called AdPrize. It is more like a manual surf where you go through your chances. You get chances by viewing PTC ads. You can win up to $50 and even a Golden membership of $90 value! Paid To Sign Up (PTSU) are paid offers. You get paid for registration to the advertised sites. How it works: choose an offer, read its description, register to the site via the given link. Enter the required data into the form (usually username + welcome email). Sometimes you get paid just for sign up or you have to click few days on the site before your completed offer gets approved. Sometimes membership purchase is required (usually offers with much higher rewards). Rewards are credited to your account after approval. There are much higher rewards in PTSU section than in PTC section. PTC sites with PTSU section: e.g. CashNHits, CashTream, GPTPlanet, Cashons. Get Paid To (GPT) sites are sites with many more options how to earn. There are not only ads for click, but many more kinds of other simple tasks you can do. E.g. watching videos, playing games, taking surveys, giving Likes (Facebook), +1s (Google), Follows (Twitter), Subscribes (Youtube), trying apps, programs, downloading and many more, such as MicroJobs (Tasks). PTC sites which are more like GPT – they have many ways to earn: e.g. Neobux, Clixsense, Clixten. Such sites are also more stable than those that have PTC section only. Example of good GPT sites with PTC section: RewardingWays, DollarSignUp. Example of GPT site without its own PTC section (PTC ads only via offerwalls): Get-Paid (very nice site, cool design, have fun while earning). GPT sites are characterized by having a lot of offerwalls. Offerwall is a section which brings together a variety of paid tasks. Most of them are from a different provider than the GPT site. Every offerwall has a different provider. Every GPT site can add any offerwall to the site. That’s why most of the GPT sites are very similar – because they have the same offerwalls. Examples of offerwalls: Matomy, SuperRewards, TrialPay, SuperSonicAds, PTCWall, Virool, LikeFlow, AdWorkMedia, TokenAds, MinuteStaff and many others. There is usually a specific offerwall called CrowdFlower at the GPT sites too. Its offers are called MicroJobs or Tasks. Those are very simple tasks for a few minutes or even just seconds. There are many kinds of tasks: e.g. search for authors, address search, choose the correct category of images, find owners of companies, sort tweets into categories and many more. You usually get a link to a source of information (website) where you can find the answer to the task. So you search for the information there and then fill in if you found it or not (and sometimes that’s all you need to do in the task). Rewards for completing offers are much higher than from clicking ads and are directly in cash (usually in dollars) or in other virtual currencies like Points, Coins etc. Sometimes these are exchangeable to cash, sometimes not. Example of GPT site with CrowdFlower tasks: HeedYou. Another thing which you can encounter at PTC sites is a Traffic Exchange (TE) section. Here you view advertisers ads and you get Points/Credits for that which you can use for your own advertising at the site. Advertising in the TE section is for free which is a big advantage. Credits can be purchased too. You get different rewards per ad view at different site, usually it is from half to 1 Point per ad view. The time you have to spend on viewing the ad differs too, usually it is from 5s to 20s. Sometimes there is a game hidden in the TE where you can win various prizes – e.g. cash, Points or even a membership. There are also sites that specialize in exchanging traffic and are called Traffic Exchanges. Those are more sophisticated TEs which have a lot of options, plenty of settings. Typical for them is e.g. Auto-Assign function – automatically assign earned credits to your advertised site. You do not have to manually assign the credits. Your site appears to members right after you earn some credits. Most of traffic exchange sites have a lot of competitions and games. Therefore, browsing sites (called surfing) is much more enjoyable here (e.g. TrafficSwirl). Most of them also have a chat window so you can chat with other members while surfing. Surfing is the typical feature of traffic exchange sites. Do do not click ads one by one and close them everytime, but you continue in the same window. You validate an ad view by clicking the correct image/number and you are immediately taken to the next ad. It is very easy and fast. You get credits for surfing in classical TEs, in better TEs you get cash too – per every site viewed or for a certain number of sites surfed. Example of TEs where you get cash for viewing ads: EasyHits4U, NewWaySurf. Sometimes the PTC site also has a section where you can take surveys, although it is quite rare. In many more cases taking surveys is part of an offerwall or the site is specialized in taking surveys (it is not a PTC site). You can earn good money by taking surveys, way more than by clicking ads. Example of a surveys site: MarketAgent. Surfbars are another way of easy earning on the Internet from home, sometimes associated with PTC sites. How it works: you download a program, install it, run it. A small window opens (called surfbar) that is displaying banners. You get rewards according to the time the surfbar was running. Sometimes you have to enter a captcha from time to time (copy numbers/letters). You start the program and that is all you have to do to earn money. Just keep it running and it will be earning. So simple. Earnings, however, are extremelly low and cashout limits are high. Therefore, you reach the payout minimum after many months or even after a year (and most of the surfbars are not even paying). Many surfbars have more options of earnings – PTC ads, Grid game, other games, various competitions and team competitions etc. Thats is why they are sometimes counted under PTC sites. Generally, I do not recommend surfbars. None of them have paid me and I have tried dozens. How it works: run the autosurf, it will be automatically viewing ads. Let it run. You do not need to do anything and you earn. Mostly these sites are not paying (they are based only on views exchange with no cash rewards) or are scams. However, I ran across two exceptions that are paying: CashNHits (after sign in go to Autosurf link) and Vagex. Both sites are video-autosurfs that sell video views. That is maybe why they are still paying because they do not sell normal ads (of sites) for autosurf. You can earn several tens of dollars at Vagex monthly – depends on how long daily you have the autosurf running. Another autosurf that looks promising (currently Im testing it) is a Polish autosurf Zarabiara – with plenty of bonuses and you earn for activities on social networks too. GPTPlanet: How to click and earn at PTC sites MyFreeShares: $1150 super referral contest!